Aioi. Laid down by Harima Zosensho K.K shipyard for Kaburagi Kisen K.K. as a 2,869-ton Peacetime standard (C) Class cargo ship. Scheduled to be requisitioned by the IJN. Departs Kure with auxiliary transports TOEI and NITTEI MARUs. Arrives at Tarakan, Borneo. Preparation is made for the invasion of Balikpapan, Borneo. At 1700, Rear Admiral (later Vice Admiral) Hirose Sueto's (39) Balikpapan Invasion Convoy departs Tarakan, Borneo with IJN transports KANAYAMASAN (carrying the 2nd Construction Unit), TATSUGAMI, NANA, ASAHISAN, SUMANOURA, KUMAGAWA, TOEI and NITTEI MARUs and IJA transports KURETAKE, HAVANA, EHIME, LIVERPOOL, TEIRYU (ex-German AUGSBURG), HITERU, TSURAGU, HANKOW and NISSHO MARUs carrying the Balikpapan Invasion Force consisting of MajGen Sakaguchi Shizuo’s 56th Mixed Infantry Group (Sakaguchi Detachment) and the Kure No. 2 Special Naval Landing Force (SNLF) escorted by patrol boats PB-36, PB-37, PB-38, minesweepers W-15, W-16, W-17, W-18 and SubChasDiv 31's CH-10, CH-11 and CH-12. Cover is provided by light cruiser NAKA with DesDiv 2's YUDACHI, SAMIDARE, MURASAME, HARUSAME, DesDiv 9's ASAGUMO, MINEGUMO, NATSUGUMO and DesDiv 24's KAWAKAZE and UMIKAZE. Seaplane tenders SANUKI and SANYO MARUs provide air cover. Poor weather hampers air reconnaissance by ABDA (American-British-Dutch-Australian) forces, but ABDA Air finally locates the invasion force. Rear Admiral (later Vice Admiral) William A. Glassford's Task Force 5's light cruisers USS MARBLEHEAD (CL-12), USS BOISE (CL-47) and Cdr Paul H. Talbot's DesDiv 59's old destroyers USS PARROTT (DD-218), USS POPE (DD-225), USS JOHN D. FORD (DD-228) and USS PAUL JONES (DD-230) are ordered to stop the invasion force, but USS BOISE runs aground and MARBLEHEAD develops engine trouble. DesDiv 59 is detached and increases speed to arrive at Balikpapan at midnight on January 23rd. Storms protect the invasion force until it is almost to Balikpapan. At 1050, the convoy is attacked by three enemy aircraft, which are repulsed. At 1625, nine Dutch Martin Model 166 (B-10) bombers and four light bombers from Samarinda attack and hit transports TATSUGAMI and NANA MARUs. The latter is hit in No. 6 hold by a bomb, splinters from others that land to port alongside the same hold add to the fires raised. Navigation became impossible and over the following hours the flames take a firm grip, finally at 2100 after a huge explosion the ship sinks with unknown casualties at 01-18S, 117-43E. TATSUGAMI MARU, only slightly damaged, continues on to Balikpapan. At 2045, Hirose's invasion convoy arrives and anchors off Balikpapan. At 2130, the transports begin disembarking troops. Cdr Talbot's DesDiv 59 arrives from the south. At 0316, they begin their first attack firing their 4-inch guns and launching ten torpedoes at the anchored transports, but all their torpedoes miss. Talbot orders another attack. At 0330, USS POPE (DD-225) hits and sinks transport SUMANOURA MARU. Only nine of her crew of navy sailors survive. At 0332, USS JOHN D. FORD scores gunfire hits on ASAHI MARU whose hospital ship status is obscured by the darkness. At 0335, USS PARROTT (DD-218) and USS PAUL JONES (DD-230) hit transport TATSUGAMI MARU with torpedoes in a deep fuel tank, the resultant flooding cause her to sink by the stern in Balikpapan Bay at 01-18 S, 117-04E, and four of her crew lose their lives. USS POPE and USS PARROTT also sink the 2nd Base Force's patrol boat PB-37 with torpedoes and gunfire. At 0345, FORD sinks transport KURETAKE MARU with gunfire and torpedoes. 188 troops are KIA. ASAHISAN MARU suffers damage from gunfire and torpedoes but remains afloat. KUMAGAWA MARU suffers slight damage in the engagement. KANAYAMASAN MARU suffers no damage. At 0350, their torpedoes gone, DesDiv 59 departs southward. The Japanese Force seizes Balikpapan. Departs Kure and arrives at Moji later that day. Departs Yokosuka in unnumbered convoy also consisting of auxiliary transport EIKO MARU No. 2 GO, IJN requisitioned passenger/cargo ship (B-APK) KENSHIN MARU, IJA transports ANZAN, NICHIUN and TATEYAMA MARUs and civilian cargo ship (C-AK) FUKI MARU escorted by minesweeper W-18. At 1030 departs from off Futtsu in Tokyo Bay in a convoy also consisting of JINZAN MARU escorted by destroyer SAWAKAZE heading north east to Hokkaido. Calls at Moji ~ Chinnampo, Chosen (now North Korea) ~ Nagoya, Aichi Prefecture ~ Kure ~ Miike, Fukuoka Prefecture ~ Tsukumi, Oita Prefecture ~ Kobe ~ Nagoya and Miike. Arrives at Tokyo Bay in East convoy No. 51 also consisting of auxiliary transports KOSHIN and DAICHO MARUs, IJN requisitioned (B-AK) TOYU MARU, IJA transport TAIKYU MARU and one unidentified merchant ship escorted by torpedo boat MANAZURU. Arrives at Nagoya in convoy No. 8111 also consisting of civilian cargo ship (C-AK) KOWA MARU, IJN requisitioned cargo ships (B-AK) KYOWA and KENAN MARUs, IJA shared transport (A/C-AK) TERUKUNI MARU and government owned cargo ship KONRI GO escorted by torpedo boat MANAZURU. The others are mostly bound for Tokyo Bay. Due to arrive at Miike and load 3600 tons coal. Due to arrive Tsukumi to discharge coal and load 3000 tons cement for Nagoya. Arrives at Omuta, Fukuoka Prefecture. Arrives at Shimonoseki, Yamaguchi Prefecture. Departs Tsukumi, calls at Kobe and departs for Nagoya in convoy No. 8218 also consisting of IJA transport DURBAN MARU, IJN requisitioned cargo ship (B-AK) KONEI MARU, IJN requisitioned passenger/cargo ship SHOHO MARU, government owned passenger/cargo ship MINAMI (ex-Panamanian CAPELLA) MARU, and civilian cargo ship (C-AK) JIMBU MARU escorted by destroyer SAWAKAZE. Calls at Moji and departs for Jinsen, Chosen (now Incheon, South Korea). Departs Nagasaki, calls at Miike and departs for Tsukumi. Departs Tsukumi, calls at Kobe and departs for Nagoya. Calls at Yawata, Fukuoka Prefecture ~ Mutsure-Jima and off Chindo (Jindo), Chosen (now South Korea). Arrives at Kenjiho, Chosen (now North Korea). Departs Hesaki and arrives at Tsukumi later that day. Her NRT is changed to 1,618-tons . Arrives at Moji. Departs later that day for Saeki, Kyushu. At 0530, departs Saeki for Palau, Western Carolines in convoy K-519 also consisting of IJA transports KOYO, NITTAI, CLYDE, MOJI, YAMAGATA and KOCHI MARUs and civilian passenger/cargo (C-APK) SAIPAN MARU escorted by torpedo boat HATO, minesweeper W-18 and auxiliary minesweeper TAMA MARU No. 6. W-18 is probably detached at latitude 29N. At 1300, departs Palau in convoy P-604 also consisting of IJA transports NITTAI, CLYDE and YAMAGATA MARUs, and one unidentified merchant ship escorted by subchaser CH-39. At 1200, arrives at Rabaul, New Britain. Arrives at Buka Island, N Bougainville, Solomons. Comes alongside auxiliary aircraft transport FUJIKAWA MARU. Comes alongside and provides boiler water to IJN requisitioned cargo ships (B-AK) HEIWA MARU and KYOWA MARU No. 8 and small cargo ship ASAHI MARU No. 9. At 1400, departs Rabaul in convoy O-604 also consisting of IJA Landing Craft Depot Ship NIGITSU MARU, IJA transports HOKKO, TOKO and RYOYO MARUs and one unidentified Navy transport escorted by subchasers CH-16 and CH-17. Departs Palau and arrives at Garasumao, Babeldaob (Babelthuap), Palaus later in the day. Departs Garasumao and arrives at Palau later that same day. Departs Palau in convoy FU-207 also consisting of IJA repair and salvage vessel CHINZEI MARU, auxiliary collier/oiler TONEI MARU, IJA transports SHOKO, TOKO, MYOGI, TAIKO and UCHIDE MARUs and IJN requisitioned cargo ship (B-AK) HAKKO MARU escorted by patrol boat PB-31 and auxiliary minesweeper TAKASAGO MARU. Auxiliary minesweepers TAKUNAN MARU No. 3 and TAKUNAN MARU No. 8 meet up with the convoy. Departs Hesaki and arrives at Moji later that day. Arrives at Aioi, Hyogo Prefecture. Docks at Harima Zosensho K.K shipyard for maintenance and repairs. Repairs are completed. Undocked. Departs Aioi. Departs Kure and arrives at Agenosho Wan (Bay), Yashiro-jima, Yamaguchi Prefecture later that same day. Departs Agenosho Wan and arrives at Saeki later in the day. Departs Saeki for Palau carrying 189 men of the SNLF Tsuzuki Unit in convoy O-209 also consisting of IJA transports HOZUGAWA, NITTAI, KAYO, FUKUYO, ERIE, DAKAR, BRAZIL MARUs and SHINTO MARU No. 1 escorted by kaibokan IKI and auxiliary minesweepers AOI, YACHIYO and KOZAN MARUs, TAKUNAN MARU No. 3 and TOKUHO MARU No. 10. Auxiliary minesweepers KOZAN MARU and TOKUHO MARU No. 10 are detached at 30N. Auxiliary minesweepers AOI and YACHIYO MARUs are detached at 28N. Departs Palau for Rabaul in convoy SO-806 also consisting of IJA transports HOZUGAWA, NITTAI, KAZAN, KIBI and KOSEI MARUs and SHINTO MARU No. 1 escorted by subchasers CH-23 and CH-24. Comes alongside IJA transport SHINKO MARU and loads gasoline drums. KANAYAMASAN MARU is not damaged during the major USAAF 5th AF air raid on Rabaul. Later in the day she tows damaged civilian cargo ship (C-AK) HAKUTETSU MARU No. 3 (ex-NAGAURA MARU). Tows damaged IJA transport HOKUYO MARU. Comes alongside auxiliary transport MITAKESAN MARU and loads building and welding materials. Assists repairs on damaged auxiliary transport (ex-auxiliary Harbor Affairs Vessel) HAKUSAN MARU. 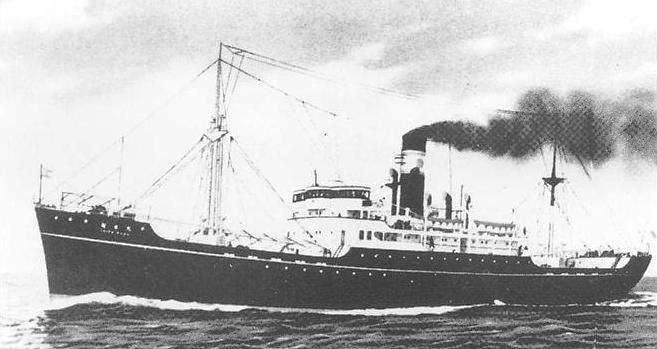 Recoals IJA transport HOKUYO MARU. Unloads gasoline drums to a motor-schooner. Supplied with boiler water by auxiliary water tanker KOAN MARU. Tows IJA transport HOKUYO MARU. Transfers all building materials to IJN requisitioned cargo ship (B-AK) TETSUYO MARU. Embarks 66 troops and 230 mail bags. At 1400, departs Rabaul for Truk in convoy No. 1210 also consisting of auxiliary ammunition ship NICHII MARU escorted by destroyer ASANAGI and auxiliary subchaser CHa-34. WSW of Mussau Island, St. Matthias Island Group. At about 1235, the convoy is attacked by B-24 “Liberator” heavy bombers at 01-55S, 149-39E. NICHII MARU takes two direct hits starboard side of the bridge and two near misses. She goes dead in the water. Fires start on the bridge and at 1430, spread to No. 3 hold. At 1500, the bridge fire is out of control. At 1530, orders are given by ASANAGI to transfer all hands to KANAYAMASAN MARU. By 1622, the whole ship is ablaze. At 1630, Abandon ship is ordered. The CO and four crewmen are KIA. About 70 nautical miles NNW of Mussau Island, Papua New Guinea, the convoy is again attacked and bombed by USAAF Consolidated B-24s “Liberator”. KANAYAMASAN MARU is hit and sinks at 01-00N, 149-20E with the loss of two of her crew. Abandoned NICHII MARU finally sinks. Removed from the Navy’s list under instruction No. 54. Also known as KINYAMASAN MARU. Thanks go to Gengoro S. Toda of Japan. Thanks also go to John Whitman of Virginia for info on USN decrypts of IJN messages.